Line a baking sheet with parchment paper, then pour the Sriracha sauce onto the paper. Distribute the sauce evenly across the paper using a spatula. Place the baking sheet in the oven and bake for approximately 90 minutes (or until the hot sauce has completely dried). Remove the baking sheet from the heat and break the dried Sriracha up (it will break into clumps). 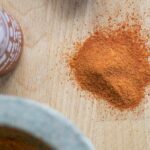 Using a mortar and pestle, grind the dried Sriracha into powder form.